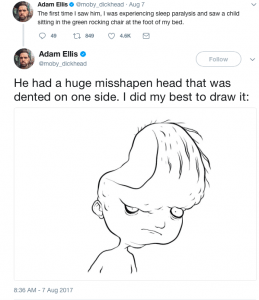 By now you probably would have read about the Internet’s latest ghost story, unfolding in real time via the Twitter account of New York illustrator, Adam Ellis. Long story short: Adam has been dreaming about a child ghost with a misshapen head, who calls himself “Dear David”. After a dream encounter that goes horribly wrong, strange things start happening. Adam believes that “Dear David” has crossed over into the real world, possibly to haunt and/or kill him. I read through the tweets and watched the videos. I’m not going to say whether I believe Adam’s story or whether I think it’s a hoax, because that’s not my intention. 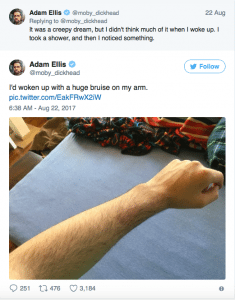 Some parts of Adam’s story sound a little too urban-legendish to be true, but many of the incidents he describes are common occurrences in real-life hauntings. My objective: to use parts of the “Dear David” story to shed some light on how stuff works in the Spirit realm. 1. Spirits can talk to you in dreams. In fact, it’s quite a common way for Spirit + your Higher Self to get through to you when your conscious defences and rational mind are temporarily at rest. The Spirits of deceased loved ones often come through in our dreams within a month or so of their passing (although some might take a longer or shorter time – remember that every Spirit is a unique individual). 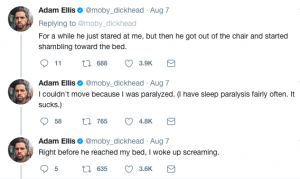 A note about sleep paralysis: it is usually associated with lower energies, earthbound Spirits, and demons. There’s a longstanding belief that evil Spirits and succubi like to sit on their sleeping victims and choke them. However, this is not always the case – higher energies, Spirits of the Light, and Angels can sometimes cause a form of sleep paralysis when they appear, simply because their energy fields are so powerful – it’s almost like an electric shock when they bring their energies so close to us. So how do we tell when it’s a good Spirit or a not-so-good one that’s visiting us? To discern light from dark Spirits, listen to your gut. Does the dream feel comforting, refreshing, healing? Or foreboding, frightening, and exhausting? When you wake up, do you feel rested – or drained? Positive, uplifting vibes and experiences usually indicate that you’ve been visited by a Spirit of the Light, whereas the opposite indicates that you may have been visited by a Spirit who hasn’t crossed over into the Light. Guess which camp “Dear David” probably belongs to. 2. Animals can sense Spirit better than we do. Back to the story! Adam moves to another apartment in the same building. The hauntings stop for a while. 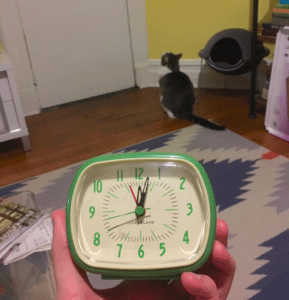 Then his cats start acting funny: they gather at his front door at midnight and, according to Adam, “just stare at it”. 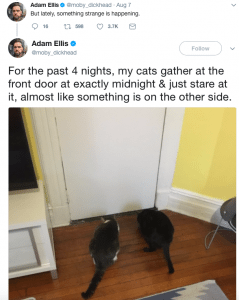 They also meow and appear a little spooked (Adam mentions “bushy tails” in another tweet, which is a classic spooked cat reaction). Could “Dear David” have finally found Adam? Anyway, my point is that a pet animal’s health, wellbeing and behaviour often hold crucial clues to the spiritual/energetic state of the household – including whether the place is haunted. The energies of the household and its inhabitants impact our darling pets’ health far, far more deeply than we can imagine. This is why, if you truly love your animals, it is absolutely VITAL that you make sure you’re taking good care of your own emotional state – especially if you pet/cuddle them often. Animals are emotional + energetic sponges. They soak up everything, and it shows. If you and your pets move into a new place and they don’t seem to be doing well – signs to watch out for are digestive problems like diarrhoea, constant whining, jumping/starting at nothing, and/or a spooked look in their eyes – and you’ve ruled out ALL feasible causes for their discomfort, consider the possibility that they can sense something you can’t. Animals are usually the first line of spiritual defence against space hauntings, space hexes, and negative environmental energies. Whatever darkness is hanging around your place will tend to go for your pets first. This trend I’ve observed doesn’t extend to entity attachments or personal hauntings, though. This is because the dark/earthbound Spirits who attach themselves to specific humans have very clear objectives – they’re less likely to focus on their targets’ pets. 3. Spirits are more apparent at certain times. There’s always something creepy about midnight (all those campfire ghost stories! ), but it’s actually true – Spirits do prefer to appear at certain times. In Western cultures, the witching hour is 3 am in the morning. In the Chinese culture, it’s midnight (i.e. 三更半夜). Fewer distractions at night = easier to sense Spirit. Remember that Spirit is pure energy. Most times, this energy is very, very subtle. Spirit is easily overlooked when we have places to go! Traffic to navigate! Deadlines to meet! But when we’re alone, late at night, with nothing to preoccupy our senses… that’s when Spirit knows we’re more likely to notice if they try to get our attention. If they move a rocking chair. Freak out your pet cat, then push a jar around. The truth is that Spirit is accessible at all times. We’re the ones who need to focus if we want to connect with Spirit. 4. Use Spiritual tools appropriately. ALL Spiritual tools must be cleansed + programmed with their specific functions before use. 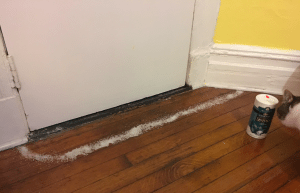 Salt is a powerful agent of cleansing, purification and protection – but without the prayers to cleanse the salt of old energies and to programme it for what you want it to do, salt is just salt. Without prayer, salt is just salt. The same goes for sage. 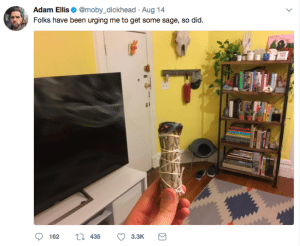 Another thing about sage, incense, and other tools that are used to cleanse spaces + objects: unless very specific prayers are used to programme them, they only work for environmental (i.e. non-sentient) energies. So you can sage a room to dispel low energies if there recently was a quarrel in the room. But sage won’t do diddly squat to get rid of the ghost of Grandaunt Mildred, who’s standing by the window and wondering why someone is burning leaves in her house. 5. Spirits can impact you physically. I mentioned earlier that Spirit is pure energy. Ghosts and spirits may not have physical bodies, but they are capable of amassing enough energy to manipulate objects and people in the physical realm. This includes touching, moving, and possibly hurting our physical bodies. This is why it’s so important for us to practice Spiritual hygiene and protection (I’ll be writing an article about that next week) – it’s important to stay safe at all levels, across all realms of existence. That being said, though, there’s no need to worry – it takes a LOT of energy for a Spirit to manipulate physical objects and people, which is why it’s relatively uncommon. Can we say the same of Adam, though? 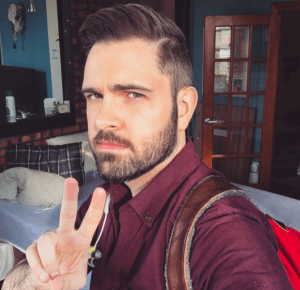 Click here for Adam’s Twitter feed + the full story of “Dear David”.